While Dubai often hogs the limelight, the principal emirate in the United Arab Emirates is Abu Dhabi which holds over 8 per cent of the world’s oil reserves. It is a key regional player and an economic power in its own right, yet few written works have examined its culture, politics, influence and economic prowess on a standalone basis. Abu Dhabi: Oil and Beyond is author Christopher Davidson's commendable attempt at addressing the perceived information gap. The author justifies his quest to write a comprehensive volume on Abu Dhabi by noting that with 90 years of remaining hydrocarbon production and with plans to increase oil output by 30% in the near future, the emirate of will have the resources and surpluses it needs – regardless of the vagaries of broader economic trends. Simply put, ignore Abu Dhabi in a regional or global context at your peril. Yet it is not all about the oil as Davidson explains via his book of just under 250 pages split by seven detailed chapters. He dives into history and sequentially charts Abu Dhabi’s transformation from an 18th century sheikdom to its current status in the global economy. Dynastic politics, culture, strategic investment (via its mammoth sovereign investment fund), regional influence, have all been examined in some detail, along with the emirate’s “new economy” and its moves away from a traditional oil and gas export oriented structure. However, the book need not be mistaken for a glorified tale or positive spin about Abu Dhabi. Rather it is a pragmatic examination of the emirate. To this end, the author does not shy away from discussing a number of problems that may surface to impede economic development and undermine political stability in his concluding chapter. Civil and socio-economic issues, media censorship, an underperforming education sector, terrorism and rising federal unrest have all been discussed. Overall, Davidson’s work is interesting and informative. It is a must read for those interested in Middle Eastern geopolitics and oil. That aside, students of history, the oil business and those of a curious disposition fascinated by the Emirates might find it well worth their while to pick this title up. © Gaurav Sharma 2011. Photo: Front Cover – Abu Dhabi: Oil and Beyond © Hurst Publishers, May 2011. Now how many times have we been here in recent times when yet another week begins with market chatter about Eurozone contagion and Greece weighing on the price of Black Gold? Quite frankly it is now getting excruciatingly painful – the chatter that is! The linkage between the abysmal state of affairs in Greece and lower crude prices is neither simple nor linear and a tad overblown from a global standpoint. Bearish trends are being noted owing to an accumulation of macro factors. Worries about state of the US economy, should lead and actually led the bearish way not Greece. Nonetheless, since Greece’s economic woes have become the poster children of wider problems in the Eurozone for a while now, concerns about its economy never fail to dampen intraday trade on a Monday. Sucden Financial Research’s Myrto Sokou notes that crude oil prices have started the week on a negative side, as weaker global equity markets and persistent concerns about Greek debt crisis weighed heavily on market sentiment and prompted investors to lock in recent profits. WTI crude oil slid lower 1% toward US$87 per barrel, while Brent oil contract retreated to retest the US$111 per barrel area. Simply put, European leaders’ decision to delay the Greek tranche payment and EFSF expansion decisions until October, has hit futures trading this side of the Atlantic. Additionally, in the absence of major economic indicators this week, Sokou notes that investors will now be watching for currency movements that could give some direction to the energy market. In any case, investors are being cautious ahead of the two-day US FOMC meeting which concludes on Wednesday. This week comes on the back of Société Générale’s research published last week which suggested a meaningful slide in oil prices should begin in the next 30-45 days. It is worth rewinding to last Christmas when a stunted recovery was taking hold and people were forecasting oil prices in the circa of US$120 per barrel for 2012. Here’s an example of a JP Morgan research note to clients from December 2010. This not to say that a US$120 price is not achievable – but the last six weeks of ‘over’ listening (or not) to the Greeks’ problems, economic stagnation in the US and even declining consumption forecasts for Asian markets has seen most analysts revise their 2012 forecasts down by almost US$10 per barrel on average. OPEC Secretary General Abdalla Salem el-Badri certainly thinks there isn’t one economic woe without the other – not just Greece! Speaking at a forum, el-Badri noted that global demand for oil was seen rising at a level which was below expectations. He attributed this to fiscal woes in Europe (sigh! ), high unemployment in the US and possible Chinese government action to prevent overheating of their economy. El-Badri, a Libyan himself, also expressed hope that Libyan production would rise by 500,000 to 600,000 barrels per day (bpd) sometime in the near future. Club all bearish sentiments together, and even the OPEC secretary general is surprised that there has not been an even greater price correction in the crude markets. Moving away from pricing, two noteworthy corporate stories these past few days have come from the US and Falkland Islands. On September 12, French engineering firm Technip announced its intention to acquire 100% of shares of US-based subsea company Global Industries Ltd. for a total transaction value of US$1.073 billion in cash, including approximately US$136 million of net debt. The deal is slated for completion over Q1 2012. Elsewhere, British company Rockhopper Exploration, which is searching for crude stuff off the coast of Falkland Islands said on September 15 that it has made further significant finds. It now expects to start pumping oil by 2016 and would need US$2.1 billion to develop its Sea Lion prospect. Company estimates are for 350 million barrels of recoverable reserves and production peak of 120,000 bpd is expected in 2018. Given the figure, smart money is on Rockhopper either partnering with another company or being taken over by a major. While Rockhopper continues to surprise, that the Argentines are moaning is hardly a surprise. The Falkland Islands have always be a bone of contention between Argentina and UK who went to war over the Islands in 1982 after the former invaded. UK forces wrested back control of the islands, held by it since 1833, after a week long war that killed 649 Argentine and 255 British service personnel according to UK archives. The prospect of oil in the region has renewed diplomatic spats with the Argentines complaining to the UN and launching fresh claims of sovereignty. Since, most Falkland islanders want to retain British sovereignty – UK PM David Cameron has declared the issue “non-negotiable”, while Argentina has declared him “arrogant”. It is at present, as the Oilholic noted last year, nothing more than a bit of diplomatic argy-bargy with an oily dimension and is highly likely to stay there. Finally, concluding on a much lighter note, the London Stock Exchange (LSE), a preferred destination for oilholics, energy majors and miners for their listings, has quite literally become a hive of activity. One is reliably informed via its press office that the LSE has introduced 60,000 bees to their new home in hives situated on the roof of its City HQ at Paternoster Square (see photo on the left). The introduction of the busy bees is aimed at encouraging growth of the urban bee population in the UK. The initiative is in a partnership with award-winning UK social enterprise - The Golden Company - which works with young people to develop viable businesses that produce, market and sell honey and honey-based natural cosmetics. Xavier Rolet, CEO of LSE Group describes the move as the perfect example of community and business working together. Ilka Weissbrod, Director of The Golden Company says bees on the roof will be looked after by their ‘Bee Guardians’ together with members of LSE staff and everyone was looking forward to seeing the bees settle in their new home. Sounds like fun! © Gaurav Sharma 2011. Photo 1: Pump Jacks Perryton, Texas, USA © Joel Sartore / National Geographic. Photo 2: Bees atop the London Stock Exchange © LSE Press Office, September 2011. Starting with the latter point first, Société Générale’s latest commodities review for Q4 2011 throws up some crude points for discussion. In the review, the French investment bank’s analysts hold a largely bearish stance over the price of crude for the remainder of 2011; even for the forecasts where the possibility of a recession has not been factored in. Société Générale’s global head of oil research Mike Wittner notes that oil markets have not yet priced in a weaker economic and oil demand growth environment. “As such, our view is that crude oil prices are due for a significant decline, which will ratchet the oil complex down into a lower trading range that will last through 2012,” he adds. He notes that the crude price drop “should” begin within the next 30-45 days, for a variety of reasons. “Current bullish supply disruptions in Nigeria and the UK are temporary, and peak Atlantic hurricane season typically ends in mid-October. As these bullish factors fade, a bearish driver will begin to emerge,” Wittner adds. As the Oilholic noted last week, this driver is the new Libyan government’s move toward a modest resumption of crude production by end-September. Couple this with weak economic data and Société Générale is not alone in bearish price forecasts. It projects ICE Brent crude to average US$98 in both Q4 2011 and Q1 2012 (each revised downward by US$15). Brent forecast for 2012 is US$100 (also down US$15). Concurrently, NYMEX WTI crude is expected to average US$73 in both Q4 2011 and Q1 2012 (down US$28). Société Générale’s WTI projection for 2012 is US$80 (down US$23). The reason for the larger revisions to WTI is that the bank expects current price disconnect with waterborne crudes, such as LLS and Brent, to continue. As widely expected, and in line with weaker economic growth, Société Générale also lowered its forecasts for global oil demand growth to 1.0 million barrels per day (bpd) in both 2011 and 2012 (revised downward by 0.4 million bpd and 0.5 million bpd, respectively). Additionally, it is now looking increasingly like that growth in non-OPEC supply and OPEC NGLs will be enough to meet demand, so OPEC will not need to increase crude output above the current 30.0 million bpd at its next meeting in December. Quite frankly, in a crude hungry world, there is nothing to stop the Syrians from seeking alternative markets. Nonetheless, the Oilholic feels it is prudent to point out that EU member nations are buyers of 95% of Syrian crude. So a sudden ban could be a blow to Assad, albeit a temporary one. From a risk premium standpoint, Syrian contribution to global markets is not meaningful enough to impact crude prices. Elsewhere, the State Oceanic Administration of China ordered ConocoPhillips China Inc (COPC) to stop all operations at the Penglai 19-3 oil field in the Bohai Bay off North-eastern China last week because of its dissatisfaction with COPC's progress in cleaning up an oil spill. The field is operated under a Production Sharing Contract wherein COPC is the operator and responsible for the management of daily operations while CNOOC holds 51% of the participating interest for the development and production phase. However, ratings agency Moody’s thinks suspension of Penglai 19-3 work has no ratings impact on CNOOC itself. "CNOOC expects the suspension of all operations at Penglai 19-3 will reduce the company's net production volume by 62,000 barrels per day, or approximately 6.7% of its average daily production in H1 2011. Although the reduction is sizable, the impact is mitigated by the higher-than-expected oil prices realised by CNOOC year-to-date, and which provide it with strong operational cash flow and a strong liquidity buffer," says Kai Hu, a Moody's Vice President and Lead Analyst for CNOOC. Even after the volume reduction and a moderate retreat of crude oil prices to around US$90 is factored in, Moody’s estimates that CNOOC will still generate positive free cash flow in 2011 and 2012, on the assumption that there is no material change in its announced capex and investment plan, and that it will maintain prudent discipline in reserve acquisitions and development. "CNOOC has maintained a solid liquidity profile, which is supported by a total of Rmb 88.37 billion in cash and short-term investments as of June 30, 2010, and compared with Rmb 40.66 billion in total reported debt (including Rmb 21.99 billion in short-term debt)," Hu concludes. 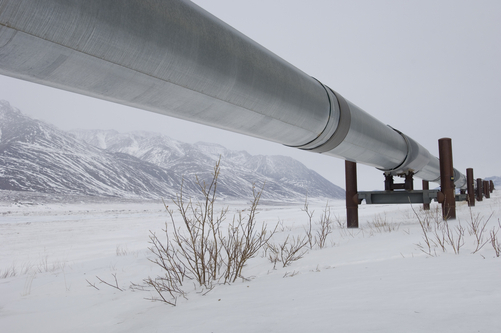 Not the time to say the Oilholic told you so – but the bears never left Crude town. They were merely taking a breather after mauling the oil futures market in the first week of August. It is a no brainer that existing conditions, i.e. fears of recessionary trends in the US, a slowdown in China and Eurozone’s debt fears, are spooking sentiment (again!). At 14:30 GMT on Monday, ICE Brent crude forward month futures contract was down 1.5% or US$1.63 in intraday trading at US$110.70. Concurrently, WTI futures contract, weighed down more by a perceived American economic malaise, was down 2.8% or US$2.58 trading at US$84.27. Feedback from the city suggests reports of sluggish Chinese service sector growth are as much of a concern as a quarter or two of negativity in the US. In fact, analysts at Commerzbank believe were it not for market sentiment factoring in possible measures by the US Federal Reserve to stimulate the economy, the WTI could have dipped even further. Additionally, the Libyan instability premium is fast on the verge of being factored out too even though its supply dynamic is far from returning to normalcy. Société Générale analyst Jesper Dannesboe believes that Brent prices are exposed to a sharp drop down to US$100, or lower, before year-end as oil demand weakens and the market starts pricing in weak 2012 economic and oil demand growth. “The recent sharp drop in leading indicators in Europe and the US suggest that demand destruction is likely to escalate, thereby resulting in significant drop in global oil demand growth. It is worth remembering that while Chinese demand growth is likely to remain solid, China still only account for about 11-12% of global oil consumption in absolute terms. In other words, the demand outlook in US and Europe remains a key driver of oil consumption, and therefore oil prices,” he wrote in a recent investment note. All indications are that Société Générale’s Global head of oil research Mike Wittner will review his oil price forecast and will be publishing new lower oil demand and oil price forecast in the investment bank’s Commodity Review slated for publication on Sept 12. However, it is also worth moving away from pricing analysis to discuss what the perceived malaise means for the energy business; both Fitch Ratings and Moody’s have been at it. 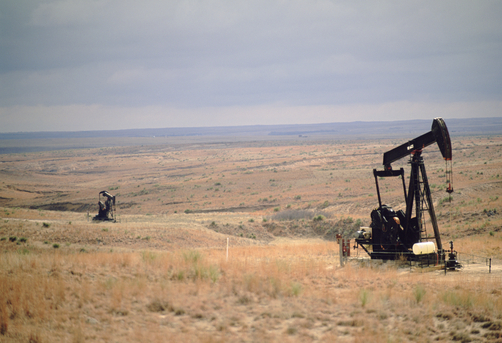 In a report published on August 30, Fitch calculates that average oil and gas sector revenue growth will be 6%-7% in 2012, but considers that there is a 20% chance that sector revenue growth may actually be less than zero next year due to slower developed market macroeconomic growth that may also adversely impact oil prices. (Click image to enlarge). Jeffrey Woodruff, London-based Senior Director in Fitch's Energy and Utilities Team, notes, “A US real-GDP growth rate of around 1.8% and an average Brent oil price of US$90 per barrel in 2012 would likely make it a 50/50 chance as to whether or not average oil and gas sector revenue grows or contracts next year." Fitch believes sector revenue growth in 2011 will average around 20% but is likely to slow to a low double-digit or even high single-digit growth rate thereafter. EBITDA growth tends to broadly follow the trend in revenue growth, but with more volatility. If sector average revenue growth slows to zero in 2012, sector average EBITDA growth is likely to be negative. The cash flow impact from such an event is likely to be modest for investment grade names, but would be more severe for companies with low speculative grade ratings that are more exposed to earnings volatility. A slowing global economy and particularly weak US economic growth could negatively impact demand for oil for the remainder of 2011 and potentially into 2012. Fitch anticipates the overall rating impact of a slowdown in average sector revenue growth in 2012 will be minimal for investment grade names. However, for non-investment grade companies, it would be an entirely different matter. Fitch believes they would be more affected and the agency could revise rating Outlooks to Negative. In a report also published on the same day by Moody’s, specifically on downstream, the agency notes that refining and marketing (R&M) sector has reached a peak in its business cycle, with limited prospects for improving from current levels over the next 12-18 months as capacity overtakes demand. As result, the agency changed its outlook on the R&M sector to stable from positive, because of the considerable risk generated by upcoming capacity additions worldwide. The stable outlook means Moody's expects business conditions in the R&M sector neither to improve nor deteriorate significantly over the next 12-18 months. It last changed the R&M sector's outlook, to positive from stable, on March 31 this year. Gretchen French, Moody's Vice President and Senior Analyst, expects global demand for gasoline and distillate to grow modestly through 2012, based on the agency’s central scenario of a sluggish global recovery. "However, a capacity glut could suppress margins across the R&M sector as early as 2012 if demand or capacity rationalisation fails to offset anticipated supply increases," she adds. After all, nearly 2.4 million barrels per day (bpd) of new capacity is scheduled to come online worldwide in 2012. Currently, estimated global demand is only 1.6 million bpd in 2012. Moody’s reckons these concerns, coupled with elevated prices, continued high unemployment in the OECD, softer US or Eurozone economies, and inflation-stemming efforts in China could all dampen demand for refined products. Blimey! Did we leave anything out? The Oilholic bets the bears didn’t either. On a related note, the latest Iraqi oil exports figures, released by country’s Oil Ministry, make for interesting reading. Data for July suggests total exports came in at 67.2 billion barrels down marginally from 68.2 billion in June. However, as oil prices rose over the corresponding period, revenue actually rose 2% netting the government US$7.31 billion with output currently pegged at around 2.17 bpd. The total revenue to end-July came in at US$48.6 billion which does suggest that the country is on track to meet its revenue target of US$82.5 billion as stated in its February 2011 budget statement. However, given what is going on in the market at the moment, future crude price could be a concern. It seems the Iraqi budget is predicated at a price of US$76.50 a barrel. So there is nothing to worry about for them, for now! Finally, here is an interesting CNBC segment on the town of Williston (North Dakota, USA) brought to the Oilholic’s attention, by a colleague who is from around those parts. He calls it Boomtown USA and it may not be that far from the truth! © Gaurav Sharma 2011. 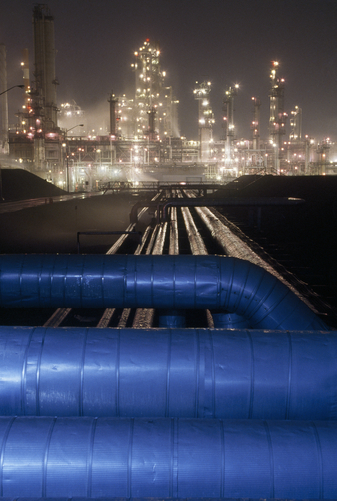 Photo: Oil Refinery - Quebec, Canada © Michael Melford / National Geographic. Graph: Oil & Gas Sector average revenue growth rate © Fitch Ratings, London 2011. Spills, spin, morals & a trusty correspondent! A corporate scandal, disaster or an implosion always creates an appetite for literature on the subject. Amid a cacophony of books – some hurried, some scrambled and some downright rubbish – you often have to wait for a book that is the real deal. 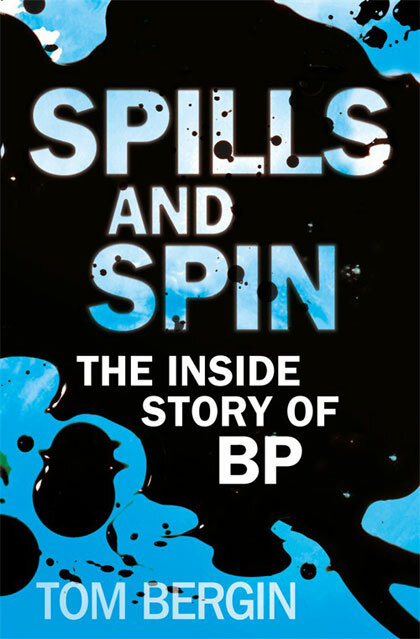 The Oilholic is delighted to say that if BP, its culture, the mother of all oil spills and its underlying causes are of interest to you, then Reuters correspondent Tom Bergin’s book – Spills and Spin: The Inside Story of BP – is the real deal and was well worth the wait. Perhaps for many potential readers of this book, the author - a former oil broker turned newswire correspondent - would be a familiar name; Bergin’s wire dispatches have been flickering on our Reuters monitors for some time. However, if you were a shade worried that so networked a man as the author would give some within BP an easy ride, then that worry gets smashed to pieces a few pages into the book. The Oilholic can safely say that in the energy business there are no moral absolutes. On reading Bergin’s account, the “pre-spill” BP it seems lost sight of morals full-stop. In a book of just under 300 pages, split by ten chapters banking on his experience as an oil correspondent, the author notes that what transpired when Deepwater Horizon went up in flames was not some isolated incident. Via a fast paced and gripping narration, he provides an account as well as his conjecture about all things BP and where did it all start to go wrong. In order to contextualise what led up to the Gulf of Mexico spill and its aftermath, Bergin first examines BP’s history and its trials in some detail, then the transformative impact – for better or for worse – of John Browne, his successor Tony Hayward and corporate decisions throughout their time which transformed a once troubled part player into a big league major. For over a decade and more, accompanying this transformation was what the author describes as the most sophisticated PR machine of all times which failed miserably when the company faced its biggest modern day crisis thereby making the CEO at the time of the spill – Tony Hayward – the most hated or the most farcical man in America; some say both. Browne’s ego, his protégés, advertising group WPP-devised “Beyond Petroleum” campaign, safety bungle after safety bungle from Texas to Alaska and boardroom politics are all there warts and all. It would be unfair to pick a component of the book and single it out as your favourite, for the whole book is. However, if one may take the liberty of doing so then Chapter 3 - "There's no such thing as Santa Claus" is the best passage of the book. Maybe the Oilholic is biased in favour of these few pages, for as a CNBC researcher working in the wee hours of the morning I had a firsthand feel of the "PR drive" Bergin refers to in that passage. When I met the author a few days prior to book’s release, he told me his work was not a damnation of a company based on a solitary incident, no matter how horrendous the Gulf spill was. Au contraire, Bergin notes the story of that spill itself did not begin on the night of April 20, 2010 but 20 years ago when a determined John Browne set out to create the largest corporation in the world followed by his successor Hayward’s own determination to succeed and then outdo his mentor. 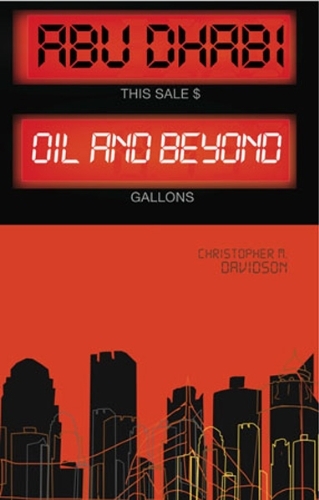 Having read the book cover to cover and seen the author deliver on his promise, the Oilholic’s overriding thoughts are that Bergin’s Spills and Spin could in the fullness of time be as definitive a book on BP in wake of Macondo as Bethany McLean and Peter Elkind’s Smartest Guys in the Room was in wake of the Enron collapse. This blogger is happy to recommend the book to fellow oilholics, students of the energy business, those interested in corporate history as well as the horrendous spill itself. Last but not the least, some from the PR industry might wish to read it as well; albeit as a lesson on what to omit from the PR playbook!